Travelling into Port St Mary from the Four Roads round about, take the right turn onto plantation road continue up the hill then turning right onto Truggan Road continue along this road where Truggan close is situated a short distance on the right hand side where number 3 can be clearly found by our Black Grace Cowley ‘for sale’ sign. Timber front door with glazed side panel. Space for coats and shoes, recessed spotlights, coved ceiling, power and phone socket. Comprising a w.c, pedestal sink with under croft cupboard with tiled splash back, fitted mirror. Good sized family dining room with coved ceilings, bespoke fitted Venetian blinds, brass plate dimmer switch and twin wall lights. 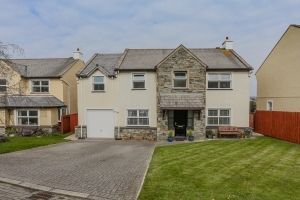 This superb additional reception room overlooks the extensive rear garden and benefits from double doors accessing out to the patio with views over Port Erin and towards the hills in the distance. Continuation of the tiled floor coverings, coved ceiling and contemporary light fitting. Access to both the outside and integral garage. Fitted with a range of base units, a sink and drainer and plumbing for a washing machine. Oil fired central heating boiler with Megaflow style hot water cylinder. Strip lighting and up and over garage door. Providing access to all rooms. Loft access via a pull down ladder, fully boarded and power sockets. A large master bedroom suite benefiting from built in wardrobes with views over the rear of the property. Comprising a corner shower unit with plumbed Mira shower, pedestal WC and twin built in sinks with storage cupboards underneath. Part tiled walls, vinyl floor covering, recessed spotlights and coved ceiling. A good sized double bedroom benefiting from twin fitted wardrobes, coved ceilings and power sockets. Comprising a contemporary white suite including bath, pedestal sink and WC. Part tiled walls, tiled floor coverings with fitted shelf and mirror over sink, recessed spotlights, extractor and additional storage space. A good sized double bedroom with coved ceiling. A good sized double bedroom with coved ceiling, including loft access. Comprising a recently fitted over sized Jacuzzi bath, pedestal WC and corner sink. Recessed spotlights, tiled floor coverings and contrasting bath surround and part tiled walls. Chrome heated towel rail, fitted wall mirror and shaver socket with light above. The property benefits from a block paved driveway which will accommodate at least 2 vehicles. To the front the gardens are mainly laid to lawn with peripheral path accessing the rear of the property. To the rear is a large enclosed garden with patio immediately at the rear, accessible from the Sun room with an additional sitting/entertaining area. The rear garden is private and enclosed and provides a superb space for a growing family to enjoy. By appointment through the agent Black Grace Cowley.